Scuba Diving allows you to discover new worlds and fully immerse yourself in the rich and bizarre kingdoms of the underwater realm. The only problem is once you’ve experienced these wonderfully strange worlds, one tends to want to explore more. Alphonse Island in the Outer Islands of the Seychelles gives you the opportunity to explore a variety of exquisite dive sites visited by very few others before you. The dive sites around Alphonse Island include shallow dives on thriving plateaus, over vibrant coral reefs and into the depths where pelagic species nest and hunt. The remote location has resulted in minimal impact from fishing and also the area seems not to be touched by the effects of climate change, which has allowed the species here to thrive and diversify. Diving with the dedicated PADI accredited Dive Team at Alphonse means that you’ll have a professional team to guide and assist you, you can obtain and/or upgrade your current experience, have access to specialized gear and equipment as well as a wealth of knowledge provided by the team who have dived these waters since the Dive Centre’s inception. PADI Advanced Open Water Diver improves your dive skills and increases your experience underwater. The course consists of five Adventure Dives. Starting off you will dive to a depth of 30m and become proficient in underwater navigation, after which you can select three more Adventure dives based on your personal preferences. Here at Alphonse we can recommend the right choice for you and encourage those focusing on conservation. Choosing to do the PADI Advanced Open Water at Alphonse Island is enhanced by our team of professional divemasters, trained conservationists and marine biologists there to guide and assist you. PADI Rescue Diver is the course through which you will learn to anticipate, prevent or deal with minor to major difficulties that might arise during a dive. It starts by developing your Rescue Skills in the sheltered lagoon and continues in the open water. The course can take up to four days, but can be less if the theory is studied via PADI e-learning at home. First Aid training is a prerequisite which we offer as a one day course. Rescue Diver is often credited as the course that teaches you the ost by student divers. At Alphonse there is a slight distraction due to the beautiful marine species like Rays and Octopus that pop into the training sites. This is truly learning with perks! PADI Divemaster is the first professional dive course with PADI which qualifies you to guide dives and assist on courses. It includes quite a bit of diving, skills development, rescue assessment, professional conduct and study. We offer a competitive Divemaster internship over three months which you are welcome to apply for. Not only will you complete your course, you will also have the opportunity to put your skills to the test with some guiding towards the end of the programme. We also ensure that you are fully involved with all aspects of the activities centre and through this gain further experience. Alternatively, if you are interested in doing the full course with us, please get in touch as the course spans over 3 - 4 weeks. PADI Underwater Naturalist introduces you to the underwater realm found around Alphonse Island. The course teaches you to group the different marine species into their respective classifications as well as what their specific role is in the ecosystem they live in. The course also points out different misconceptions we have about underwater habitats and how to develop environmentally friendly dive techniques on two dives. PADI Peak Performance Buoyancy is a great course for divers that still struggle with attaining perfect neutral buoyancy which helps to make your movements more energy efficient as well as using less air. In this course you will learn how to adjust for weighting and its distribution (trim) to help you swim and hover effortlessly. During two ocean dives you will get the chance to improve your buoyancy control skills across depth ranges on our flat plateaus as well as the sheer drop offs and practice fine tuning with your lungs to cruise over our huge coral heads..
PADI Digital Underwater Imaging helps divers with standard digital cameras to better understand the settings you need to take great underwater photographs. You will learn how to prepare your underwater photo system before the dive and partake in a photo-editing workshop afterwards. Over two ocean dives you will learn basic underwater photo techniques while diving in an environmentally friendly manner. With such an array of subject matter, scenery and light conditions Alphonse is the perfect place for you to learn and perfect your underwater photography skills. PADI Enriched Air Nitrox diving allows longer no-decompression limits than diving on normal air which allows you to dive for longer periods of time. In this course you will learn how this process works and what coinciding safety considerations you must take. You will learn how to analyse your mix and use new tables to plan dives. 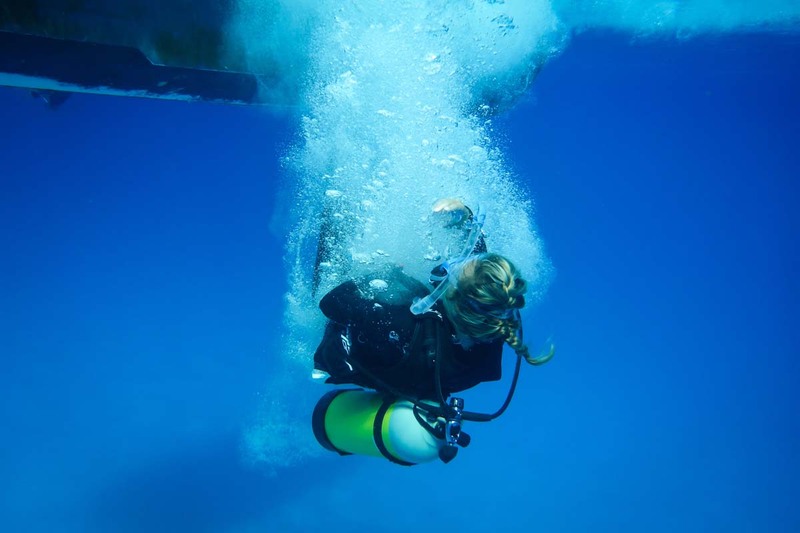 This course can be theoretical, but we include two dives to provide real underwater experience. PADI Deep Diver is for the adventurous thrill-seekers that have experienced the allure of the deep and want to see different species, coral structures and wrecks that may be at depths greater than their current level of training. Students are qualified to dive to 40m after four dives on this course in which they will learn how to make educated decisions for a stress-free, deep diving experience with an emphasis on safety. You will also learn about the equipment and techniques needed to make deep diving safe through a systematic approach to dive planning and conduct. AWARE Shark Conservation - this is an introduction to the biology and importance of Sharks. During the course you will learn all about how Sharks fit into the ecosystem, the global threats they face, what we are doing to help protect them and what more we can do to help. Once the theoretical section has been completed, you will use this new information to watch and assess the positive and negative impacts for Sharks while at the dive sites. Including two dives, you will also develop shark-friendly techniques during this course as well as learn how we can improve the conservation of the species. AWARE Fish Identification - this course teaches you how to identify the various species of fish found around Alphonse Island. During the course you will learn the techniques as well as the major groupings and common features to identify fish which will be put to the test over two dives. You will also learn how to plan and go about doing a fish survey to collect valid data for our various conservation efforts. AWARE Dive Against Debris - this course aims to teach you all about the dangers of marine debris and trash that riddle our oceans. You will learn the skills to plan and carry out complete Dive Against Debris surveys to remove marine debris and report the data in the online global database. The course includes two dives - the first will be dedicated to cleaning the seabed while the second will include removing a Fish Aggregating Device off the reef. AWARE Coral Reef Conservation - these presentations will inform you about the plight of the world’s coral reefs and describes how they function and why they are so important. You will learn why reefs are in serious trouble and what we can do to prevent further decline. Non-divers may partake in this course but divers can opt to go on coral identification and reef survey dives with our marine biologist. 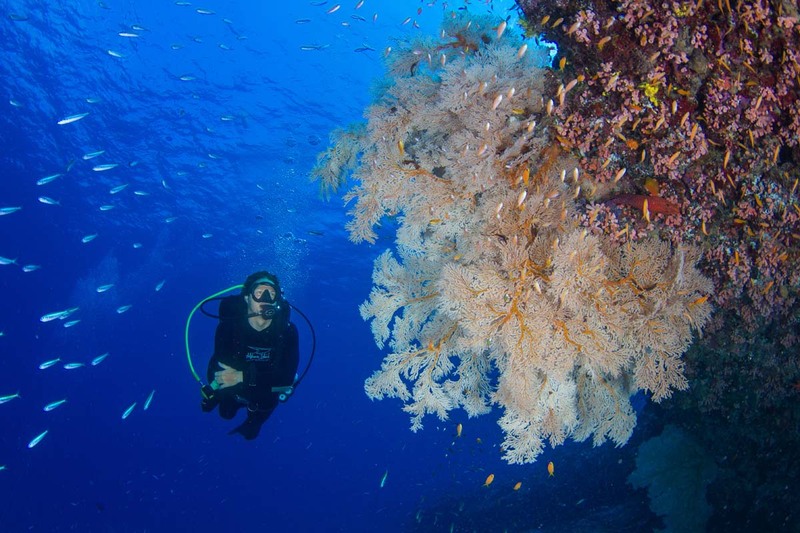 AWARE Specialist - this course is for both divers and non-divers, and teaches you about the different aquatic ecosystems of the world and what threatens them. Topics like pollution, fisheries, coastal zone management as well as the importance of aquatic ecosystems will be covered. The course will equip you with the knowledge of various ways how we can help to protect our precious marine resources and conserve the underwater environments. For more information about our selection of diving courses, be sure to contact us.